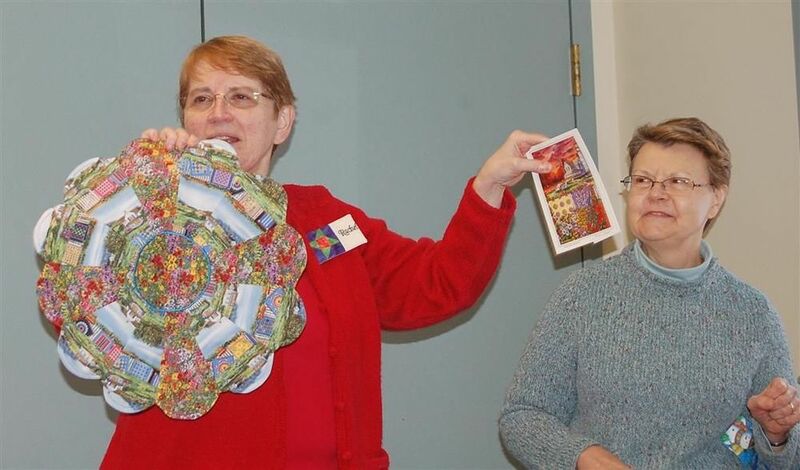 Vice President Pam M. presented a Lifetime Membership to the Guild's first President and Co-Founder, Lois T. at our December Guild meeting. 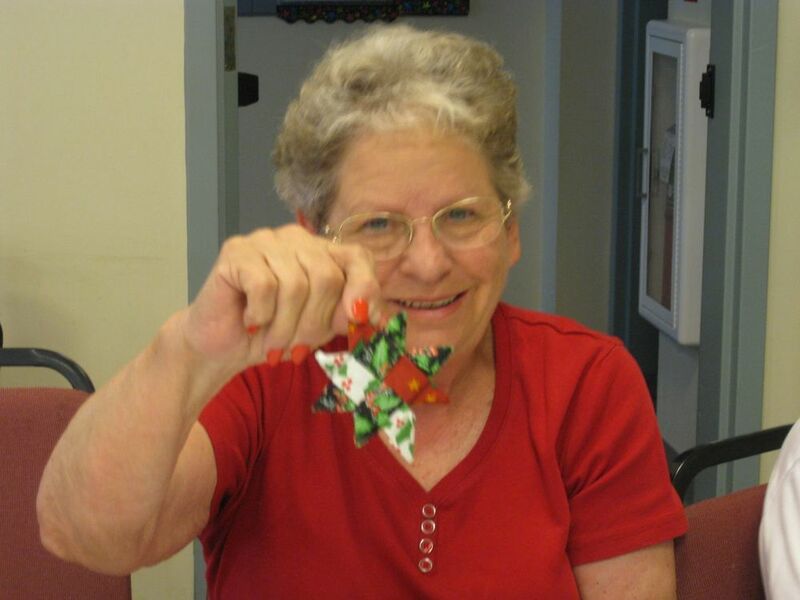 Judy S. was so inspired by Ruth W. Zentangle class that she promptly went home and completed this beautiful butterfly. 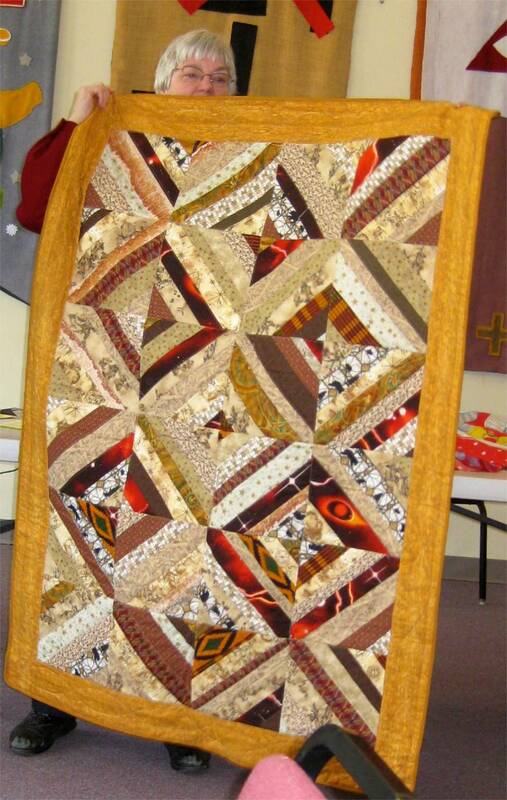 There is so very much talent in our Guild and this is certainly a testimony to that fact. 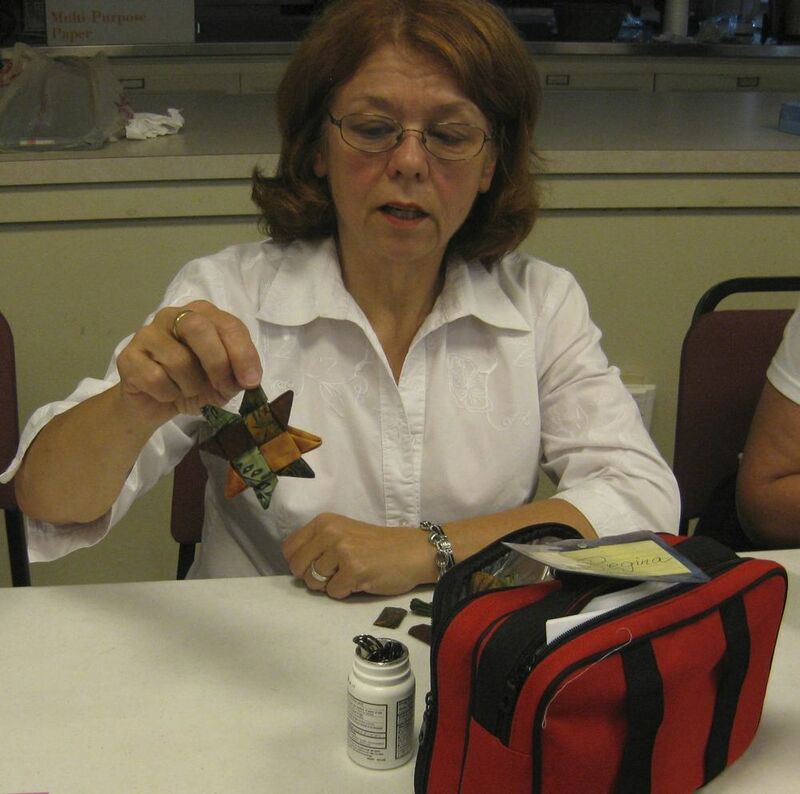 Another great show and tell. 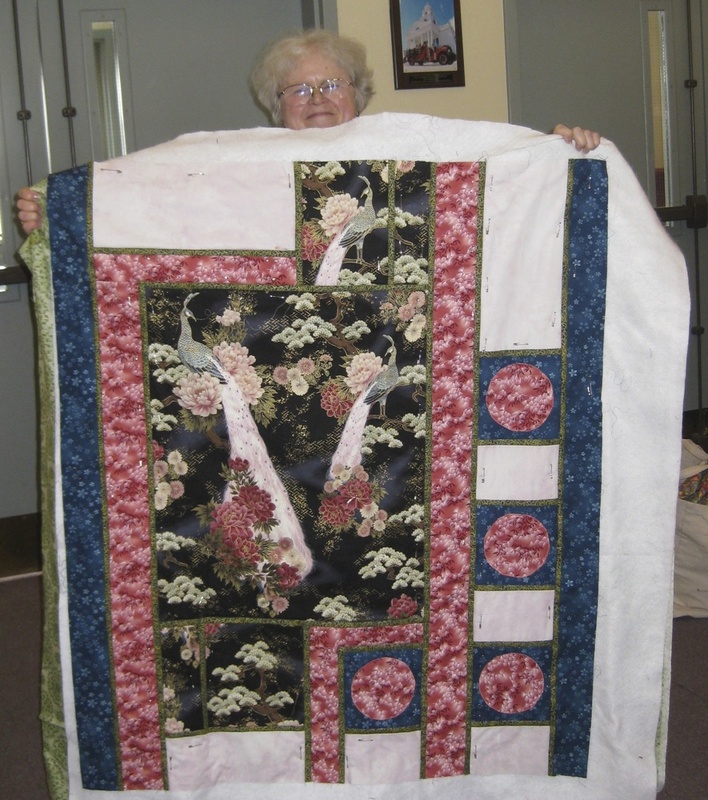 The detail picture is a close up of a hand applique and hand quilted Hawaiian quilt that one of our members mother did many years ago. 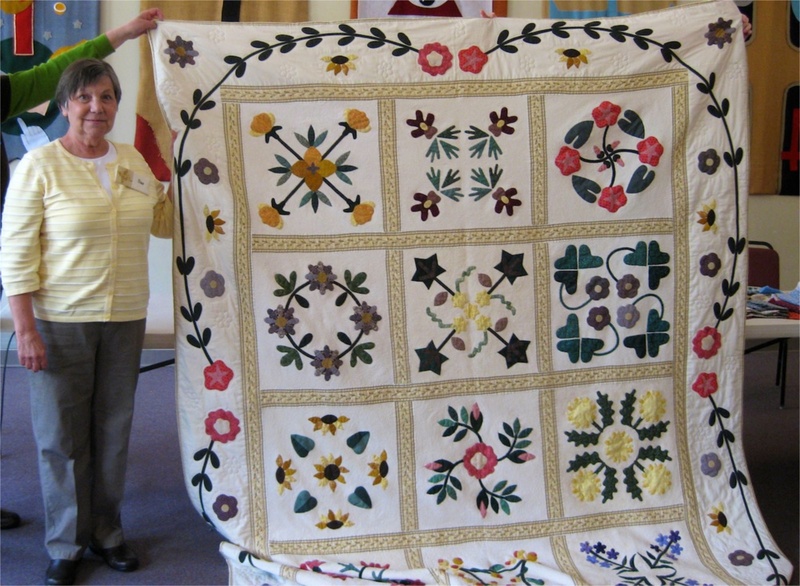 "I've never seen so many beautiful quilt! 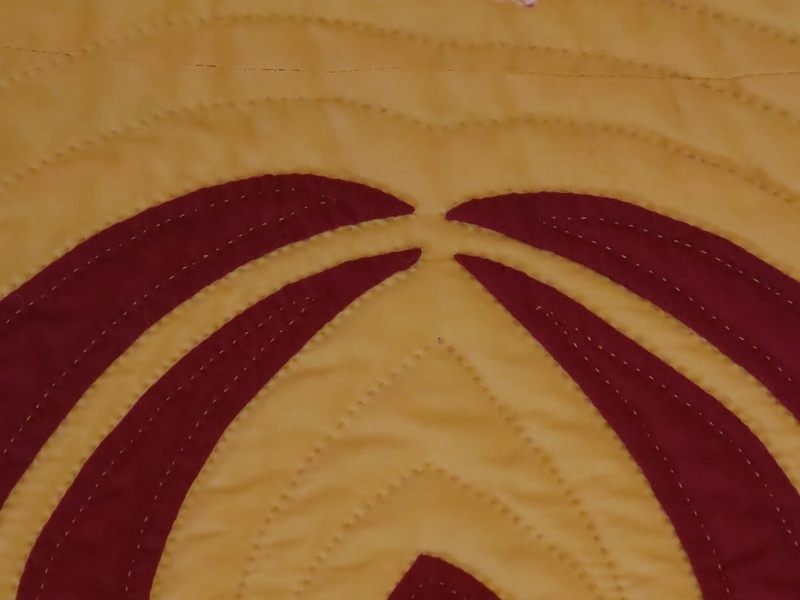 Your guild is so very talented." 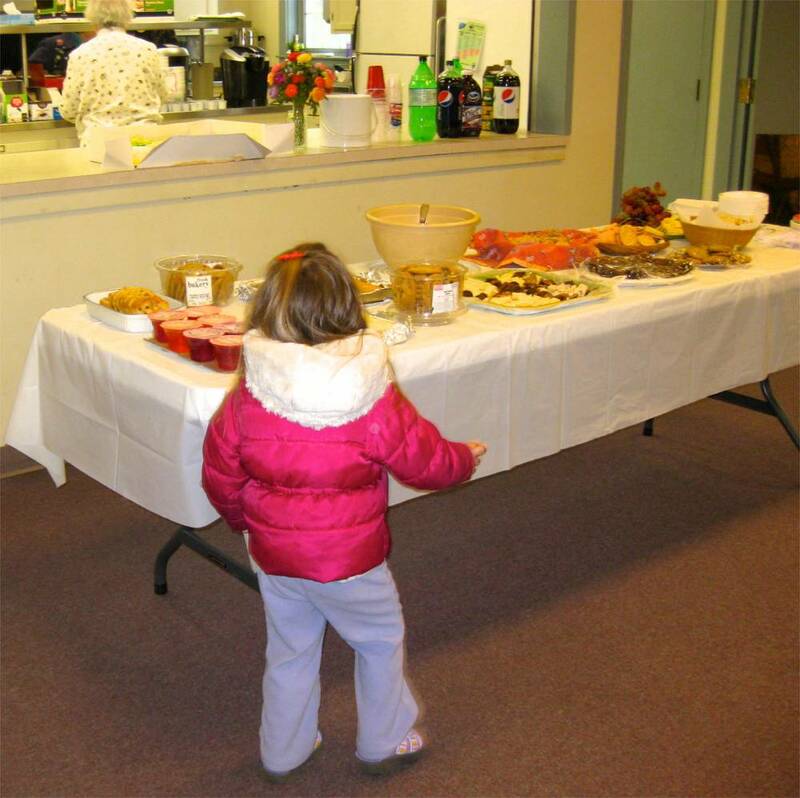 This quote, from a guest, says it all and the pictures are proof. 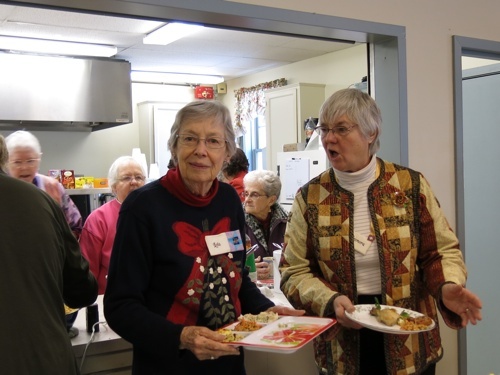 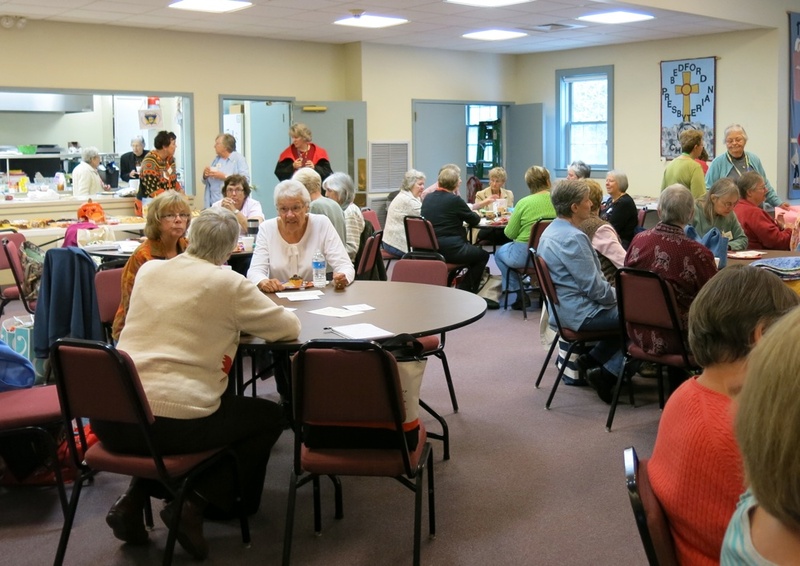 In spite of the heat wave 40 members showed up for the Christmas in July "party." 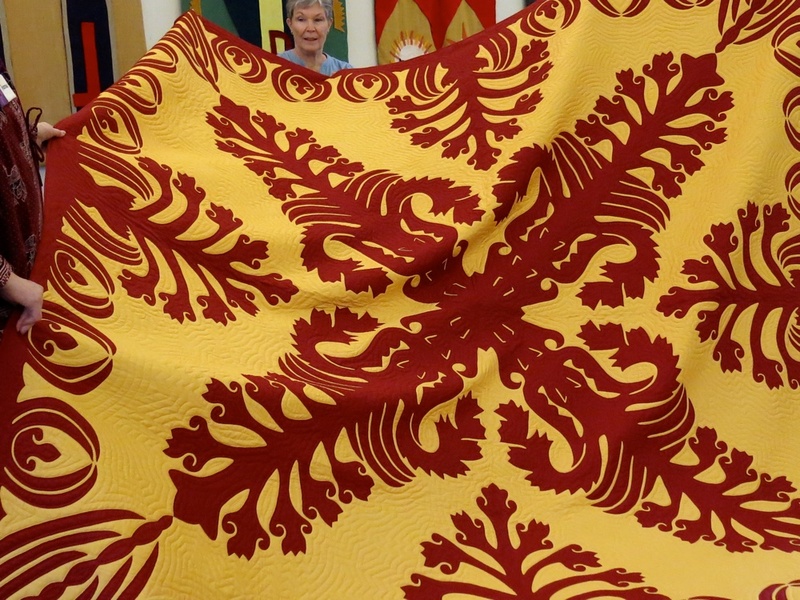 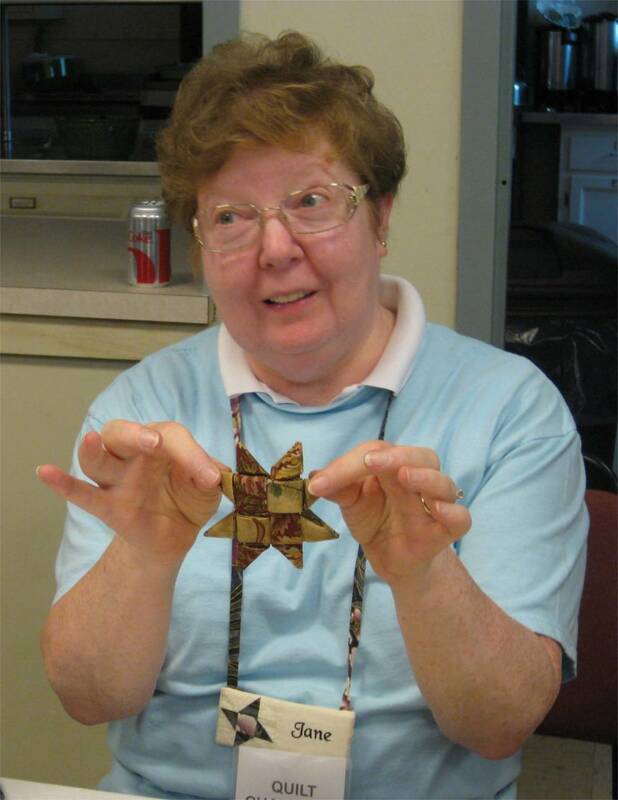 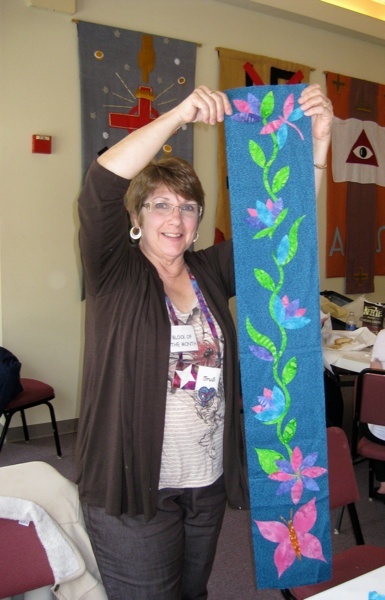 Connie did a super job teaching the Guild members the folded star design. 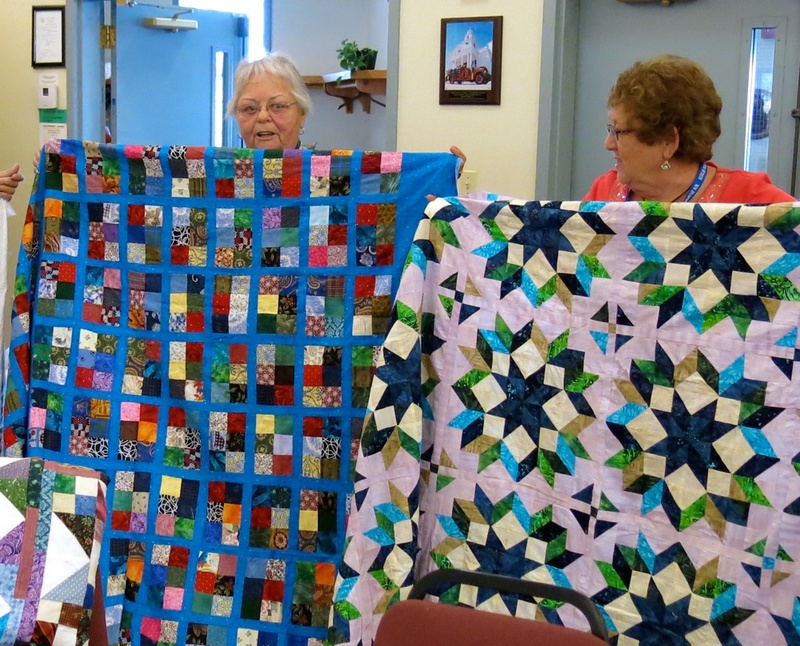 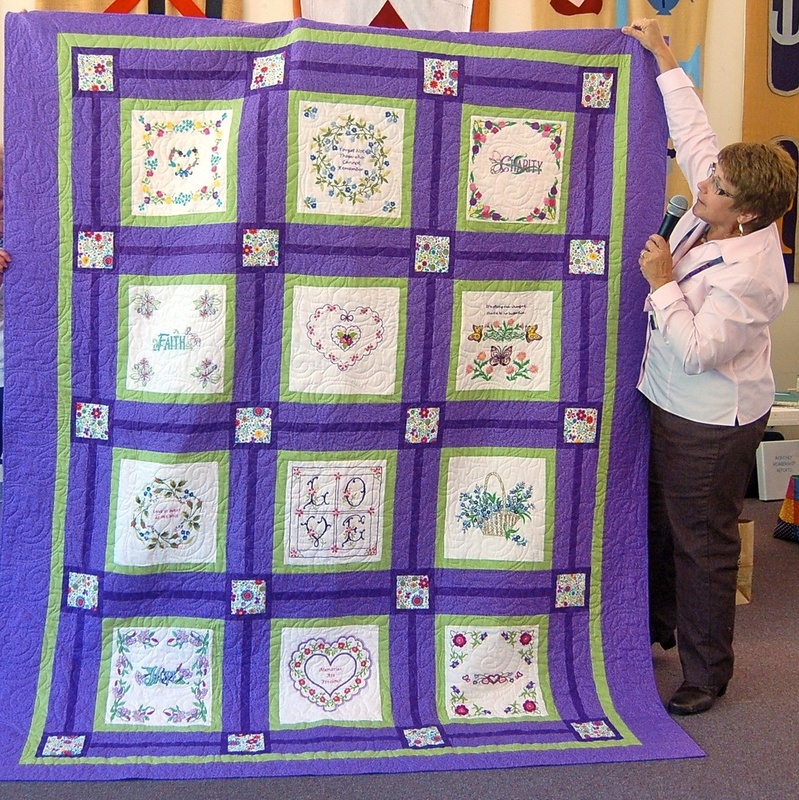 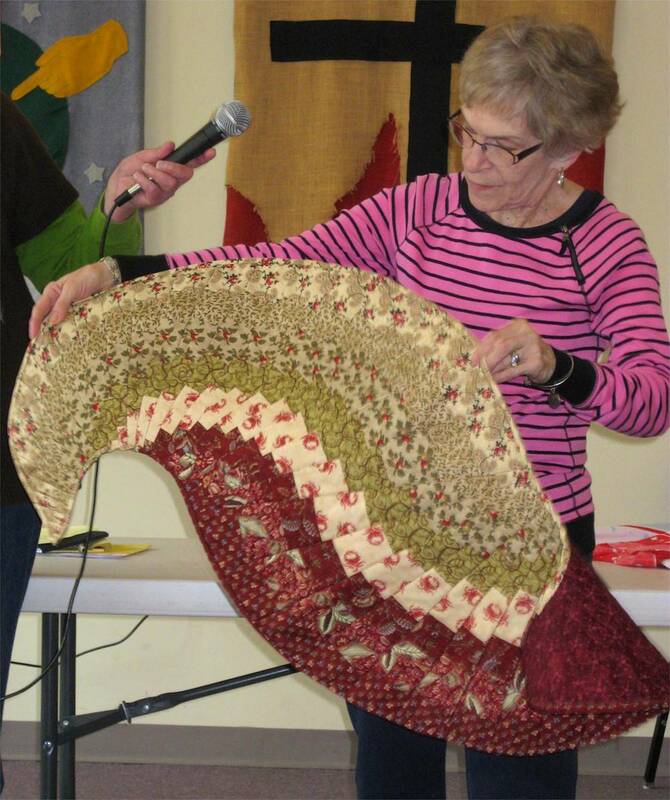 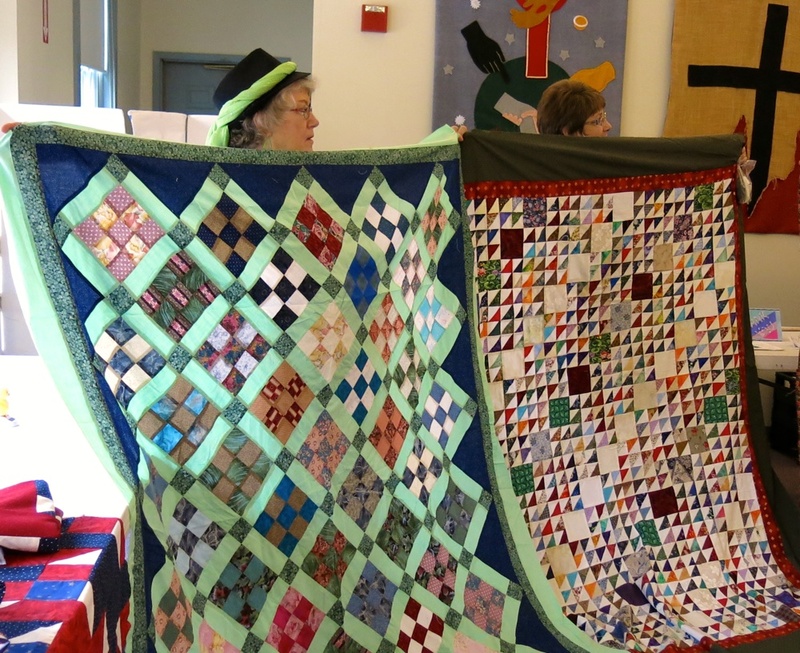 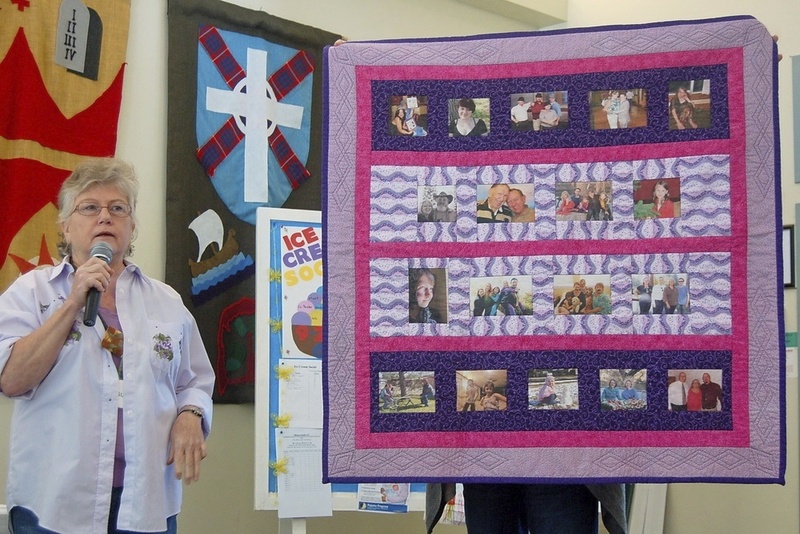 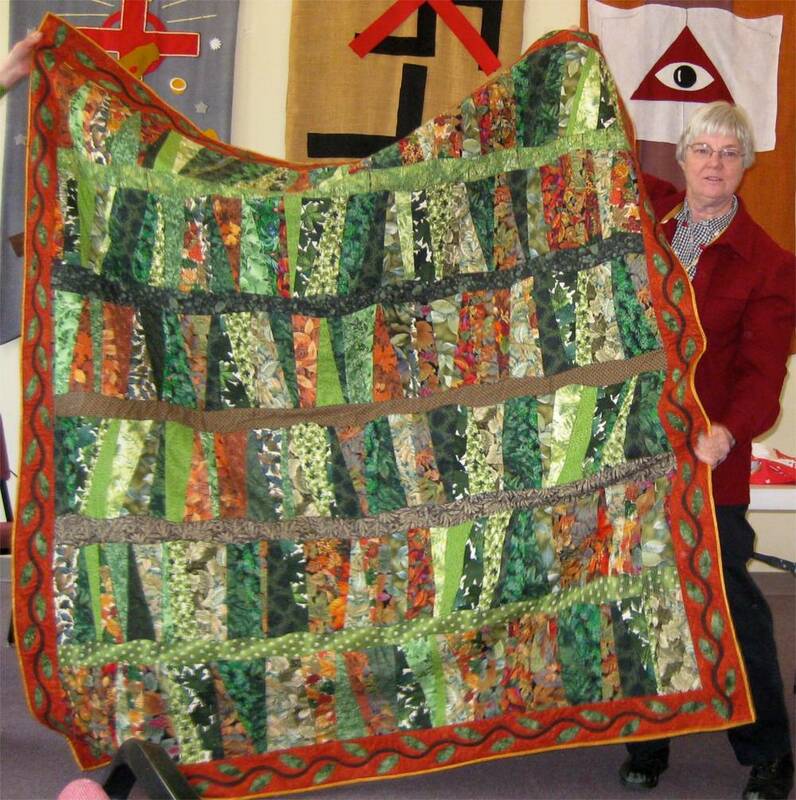 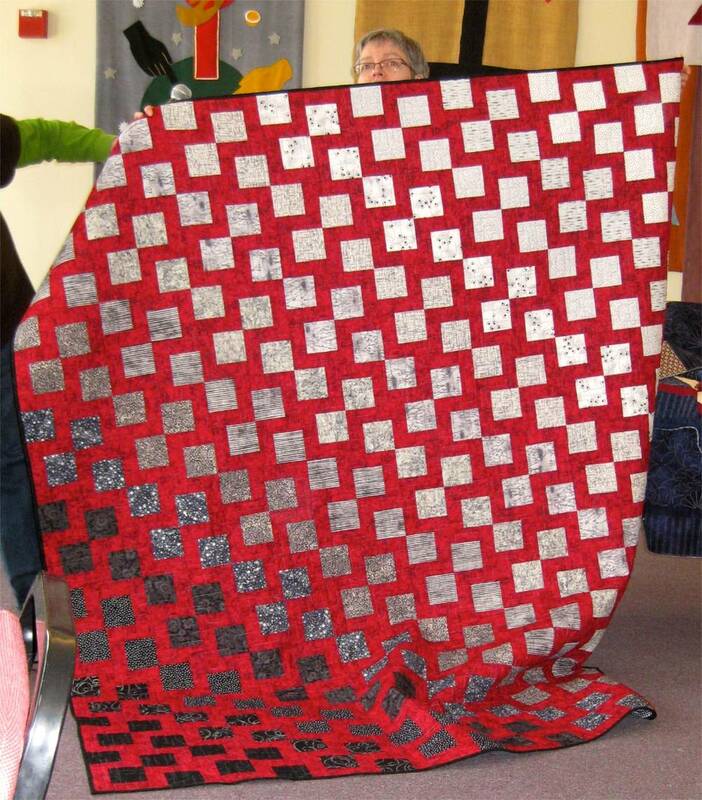 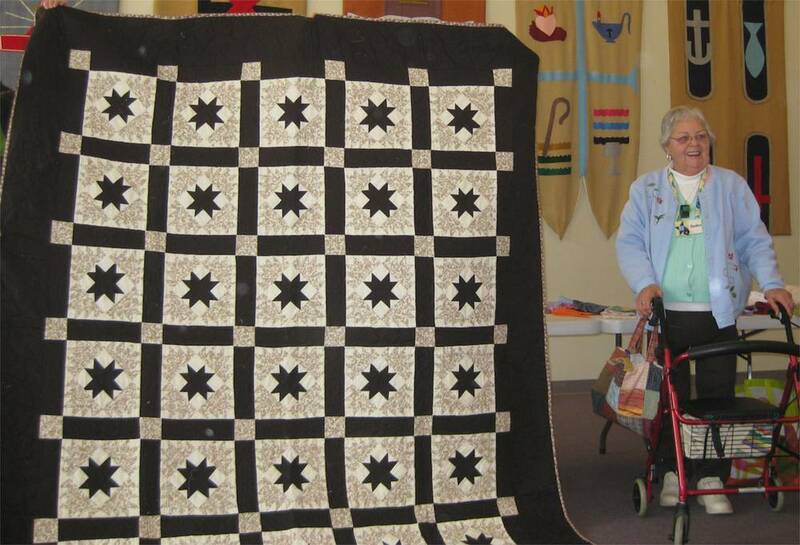 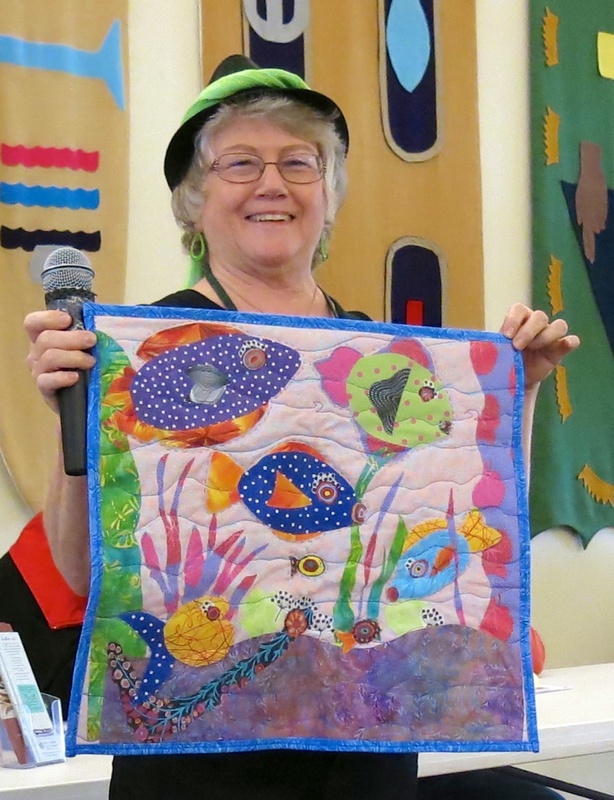 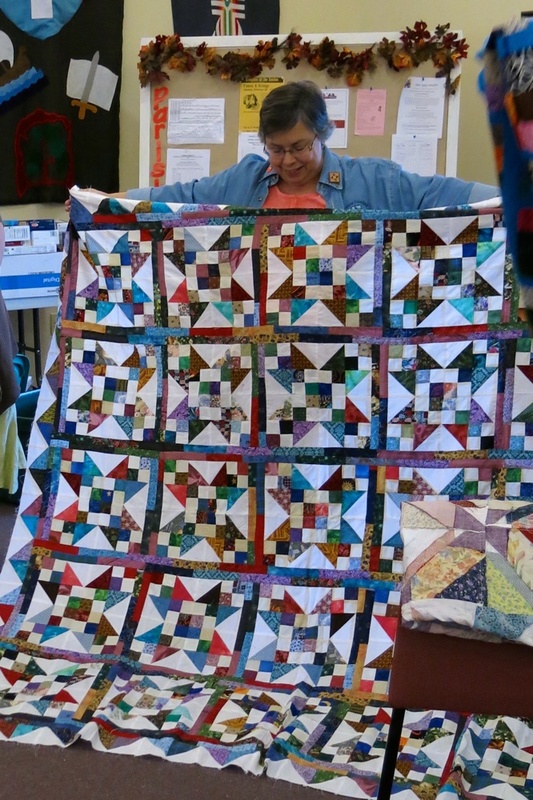 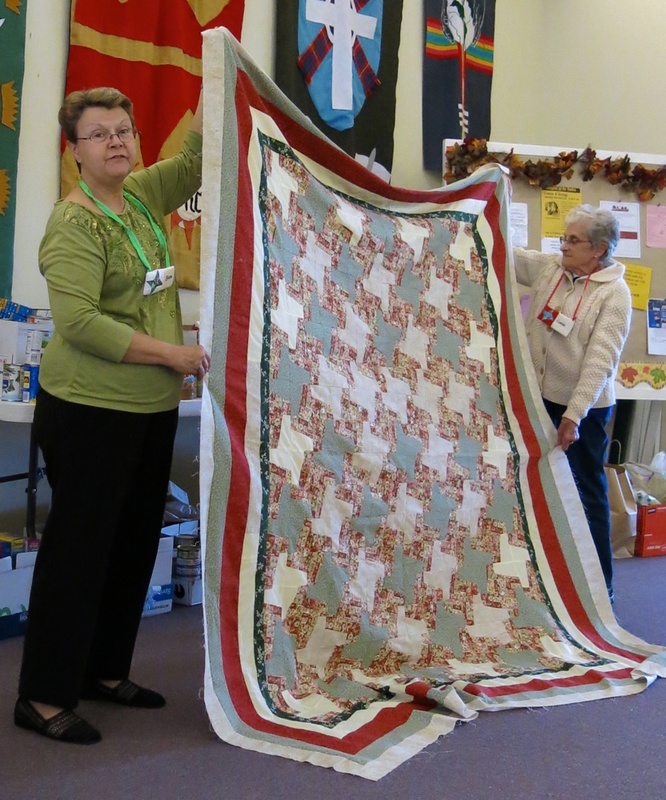 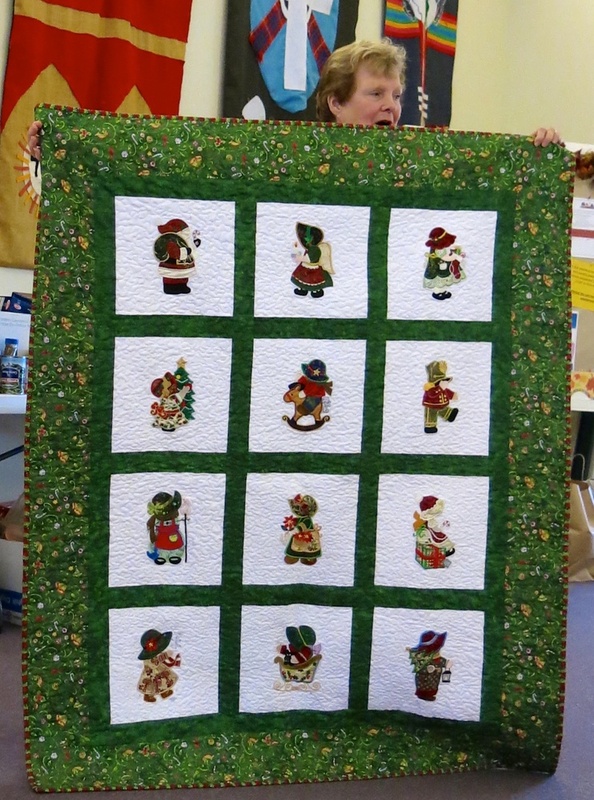 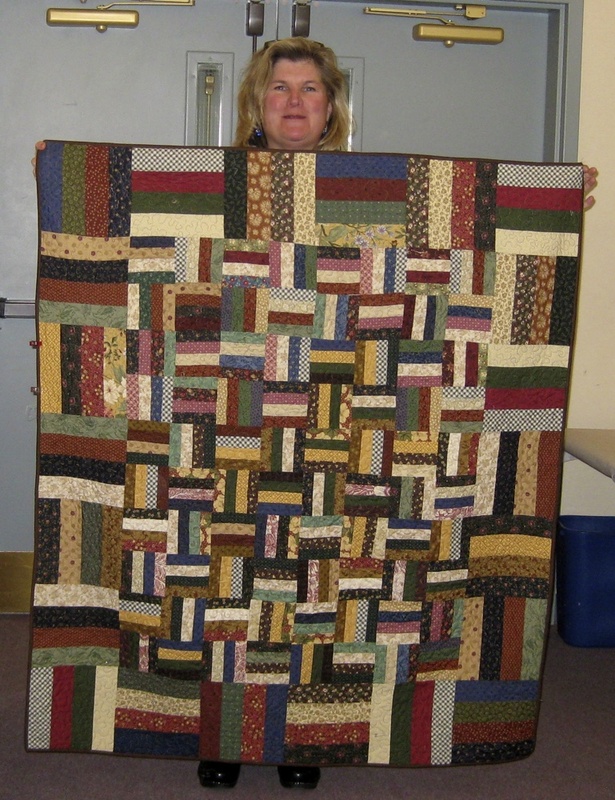 The Healing Hands quilt was given to Pauline which brought tears not only to her but to some members as well. 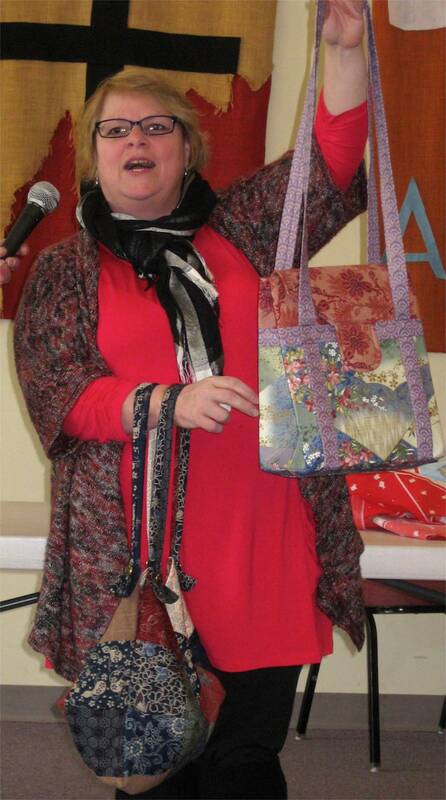 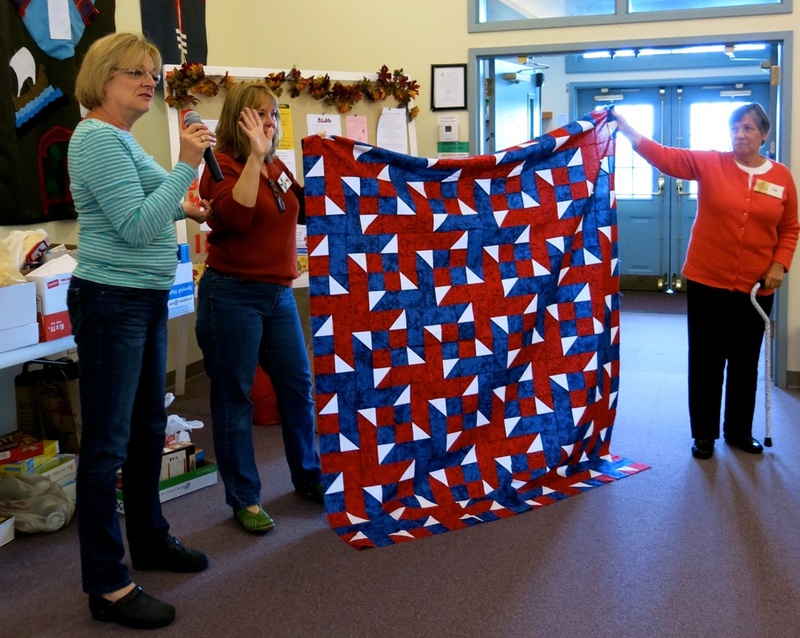 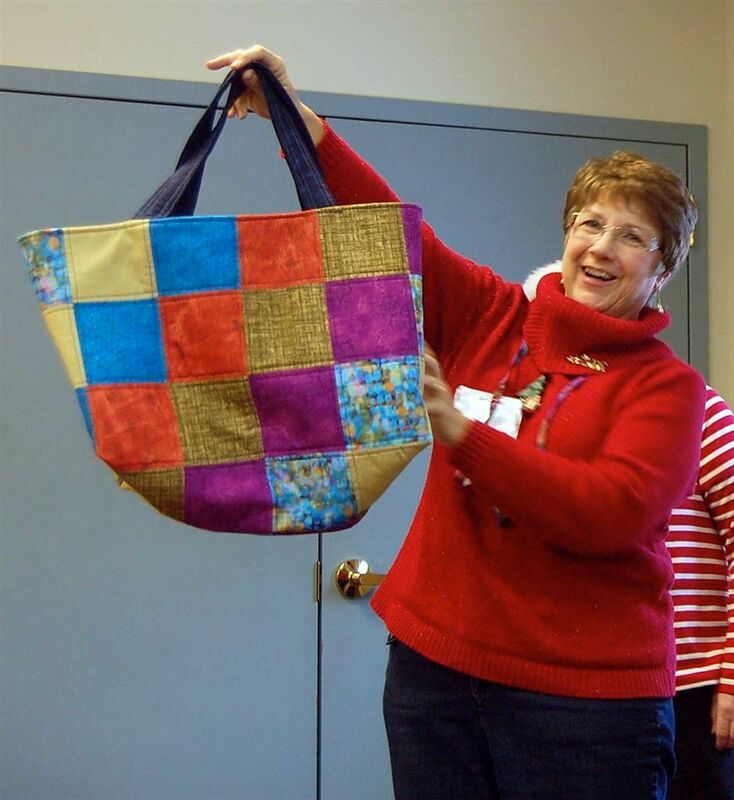 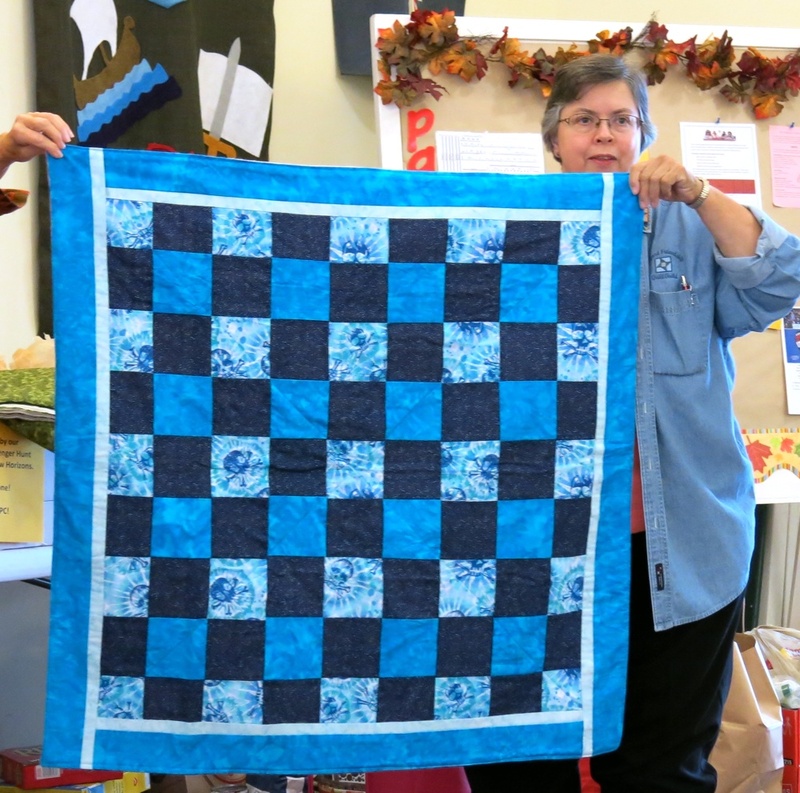 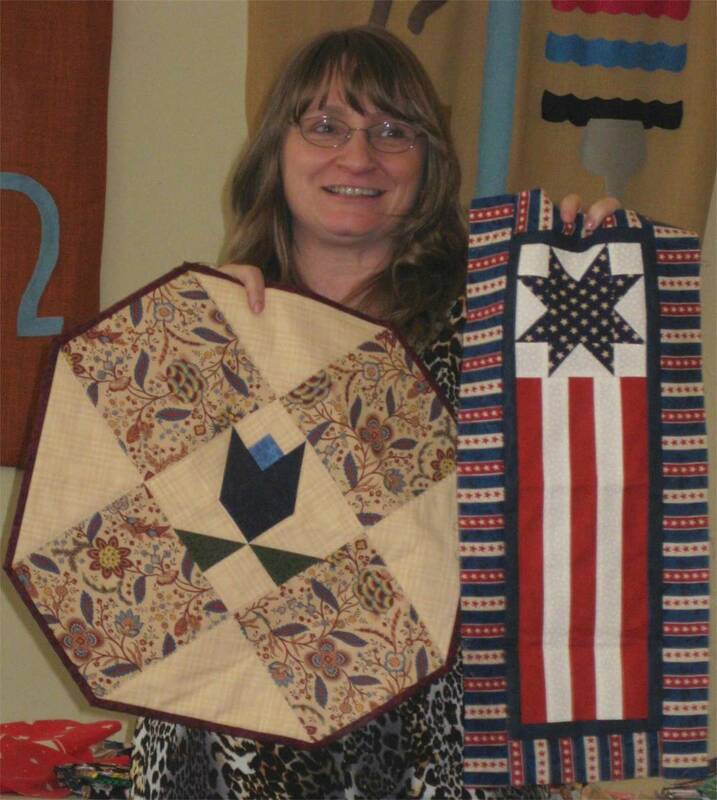 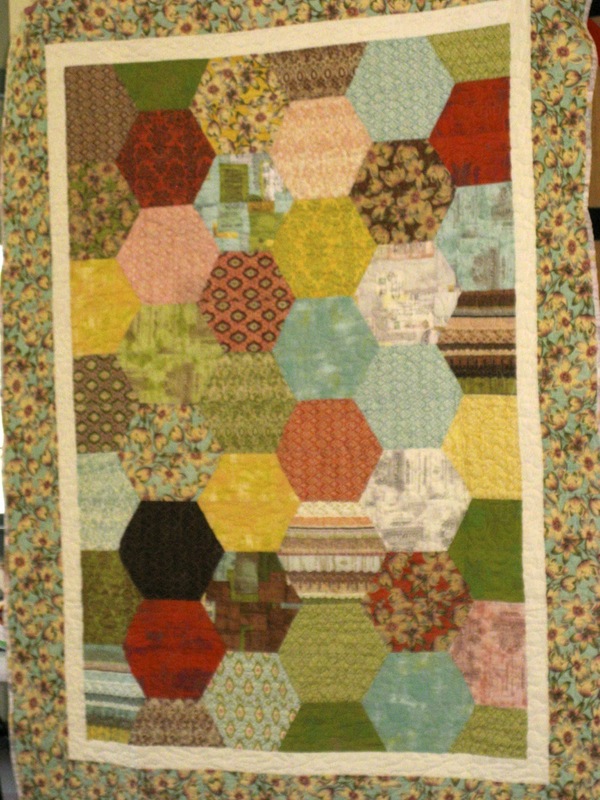 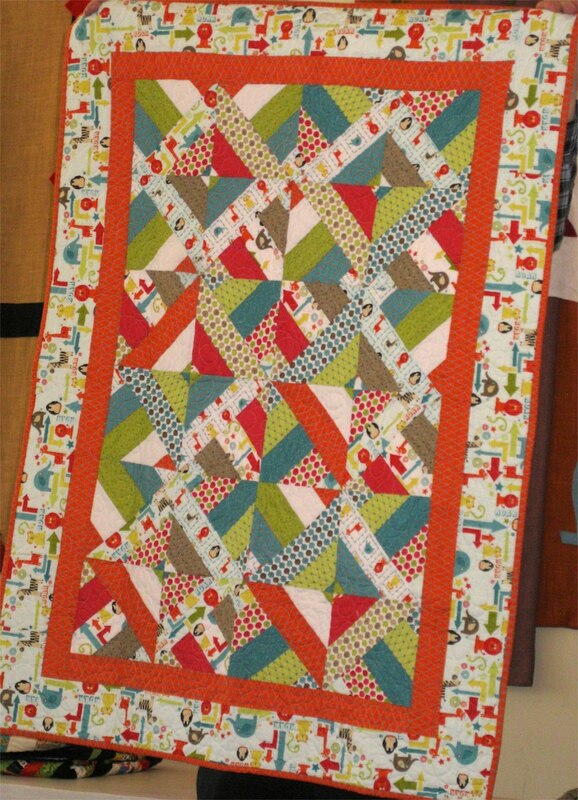 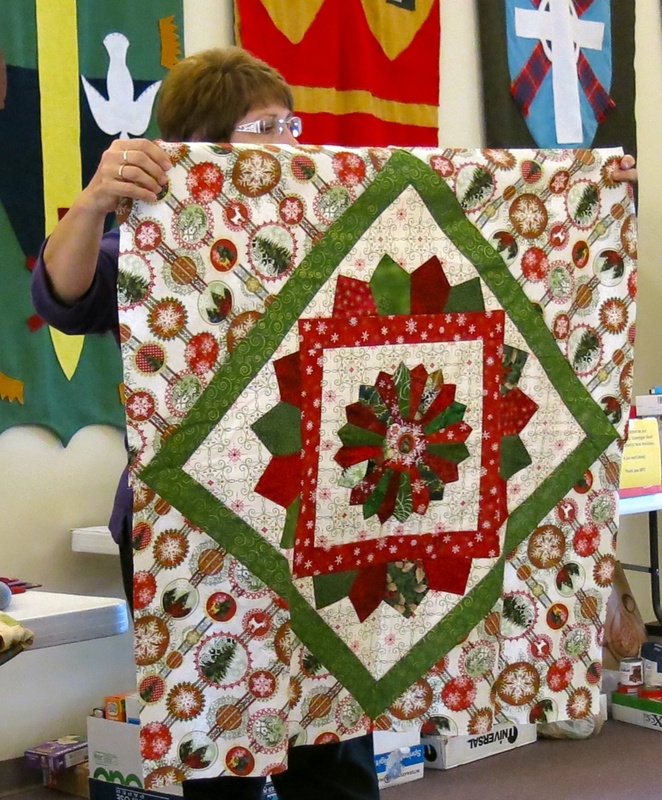 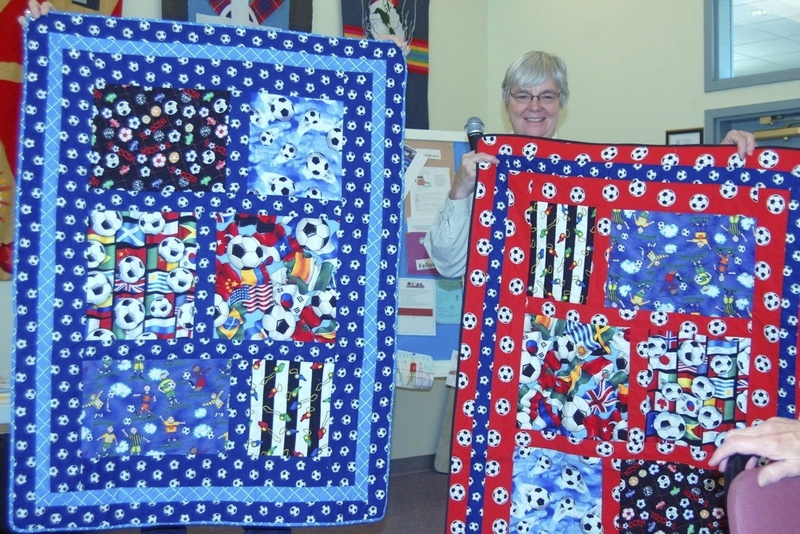 There was also show and tell which included finished FIT quilt tops from the kits given out last month. 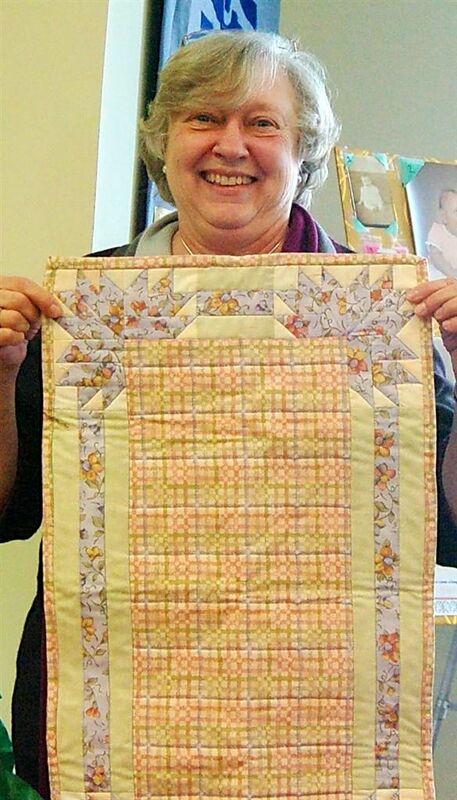 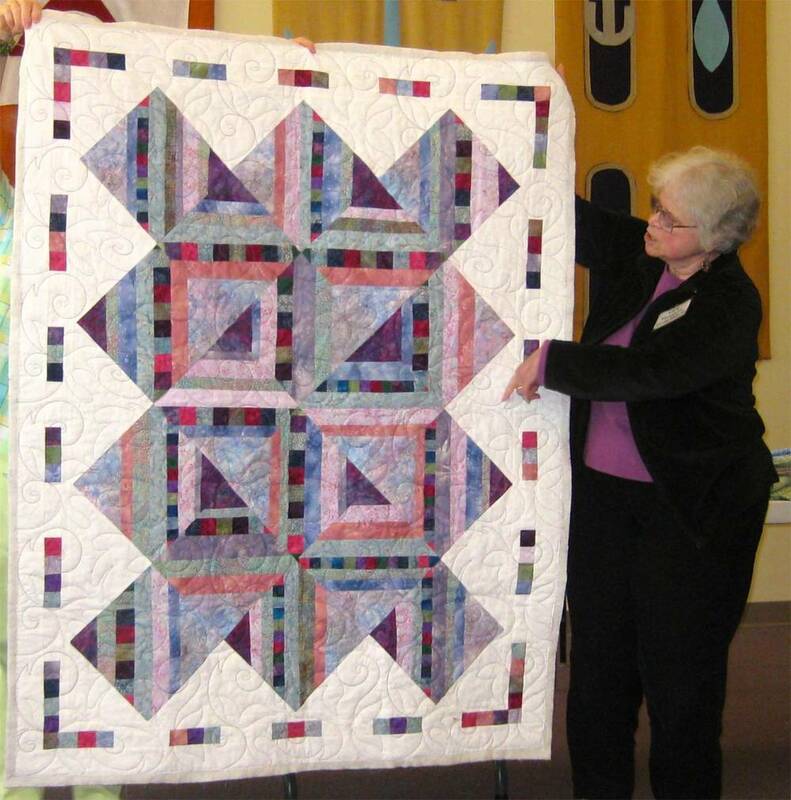 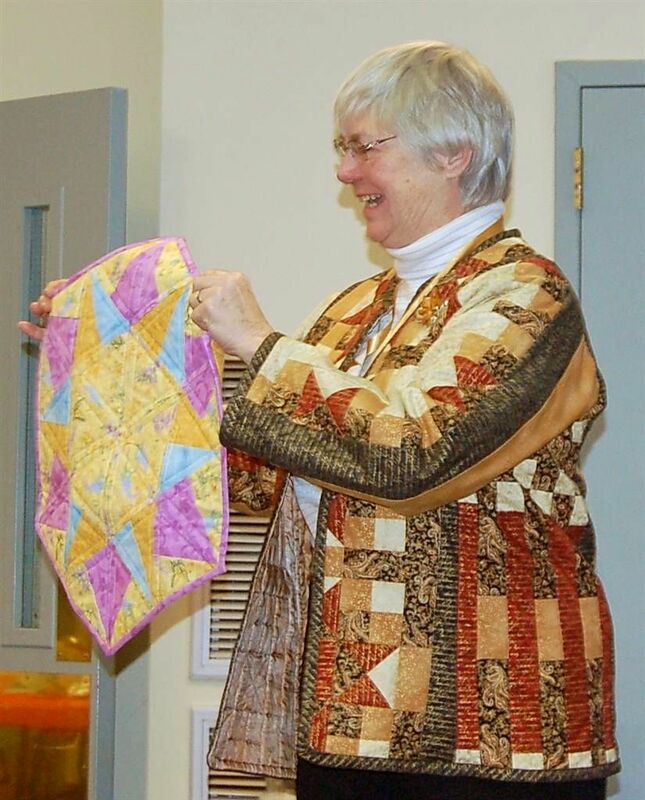 April Program - Jenny Doan of Missouri Star Quilt Co.
Jenny Doan shared her knowledge of making quick quilts from pre-cut strips and squares then translated this knowledge through her heart to all of us. 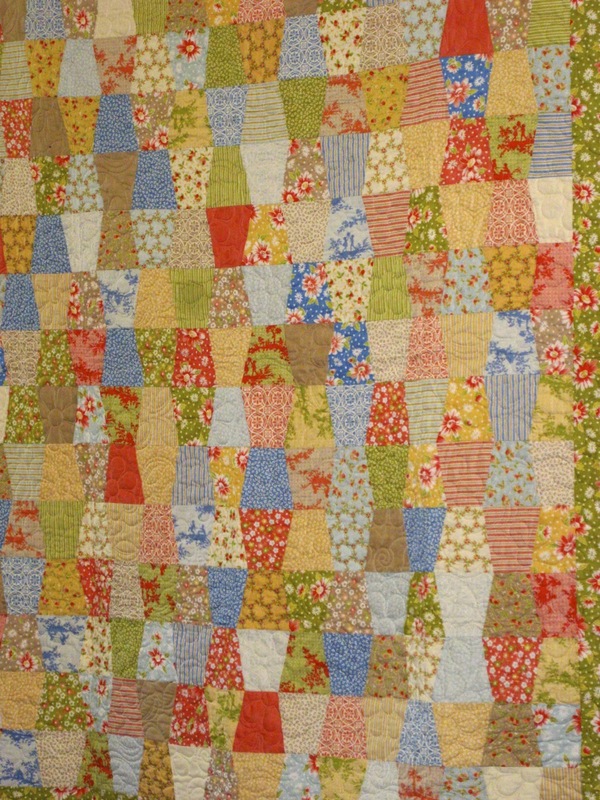 Every participant was drawn into the simplicity of the blocks and the complex look when they were put together. 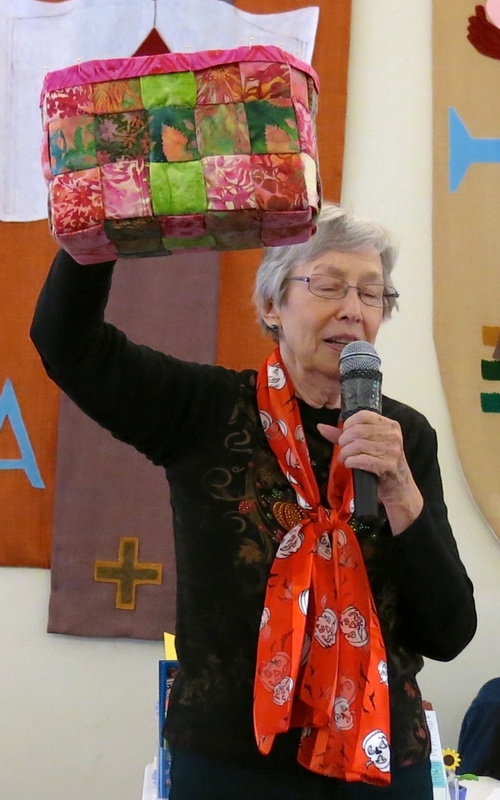 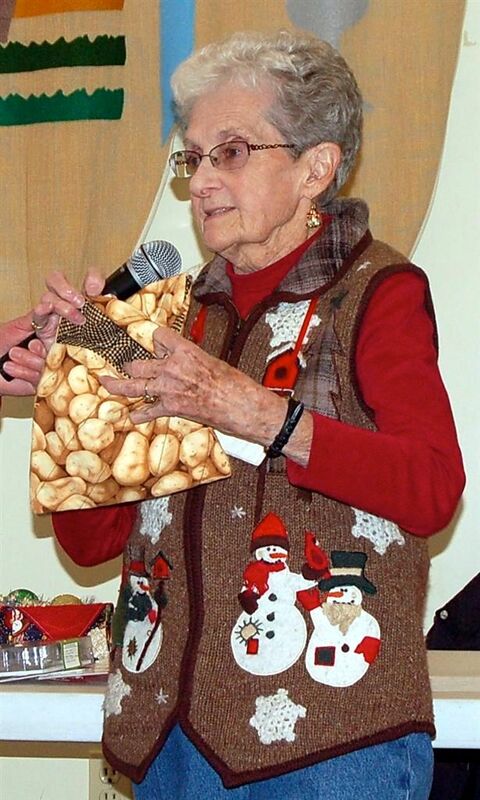 Jenny's philosophy of life, in giving to others of your knowledge, can be summarized by her quote: "cast your bread upon the water and you will get it back buttered." 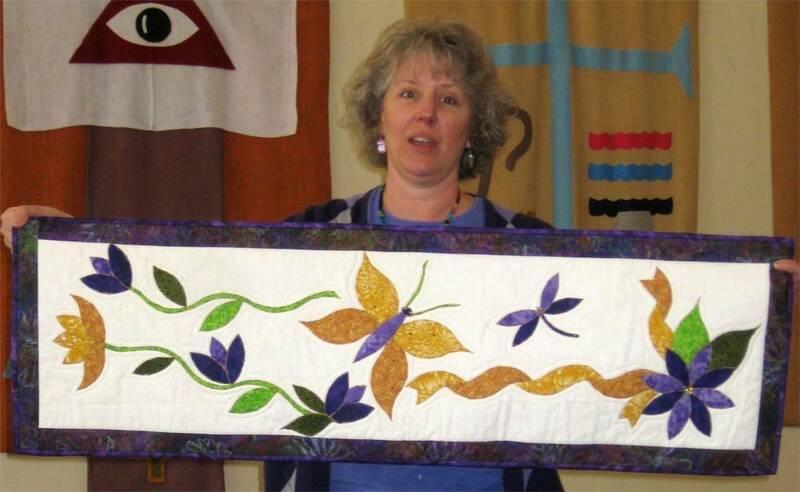 Here is a link that contains all of Jenny's tutorials. 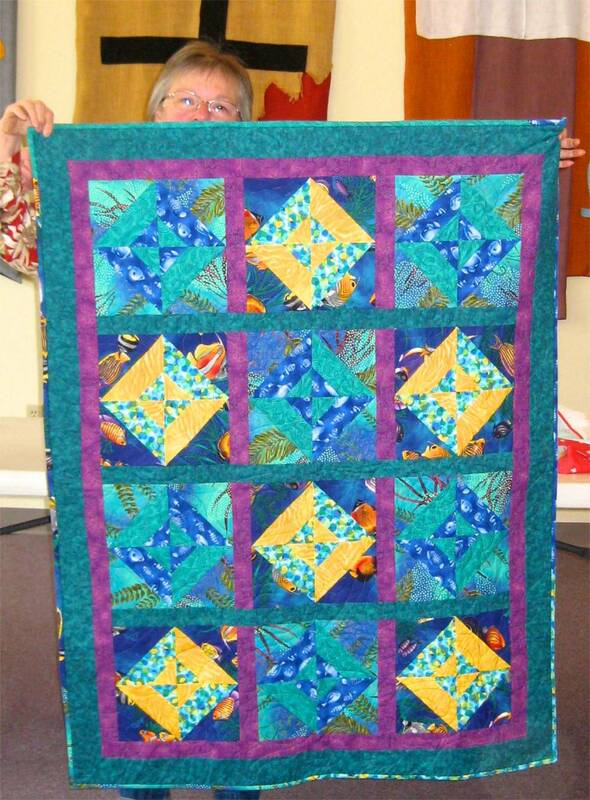 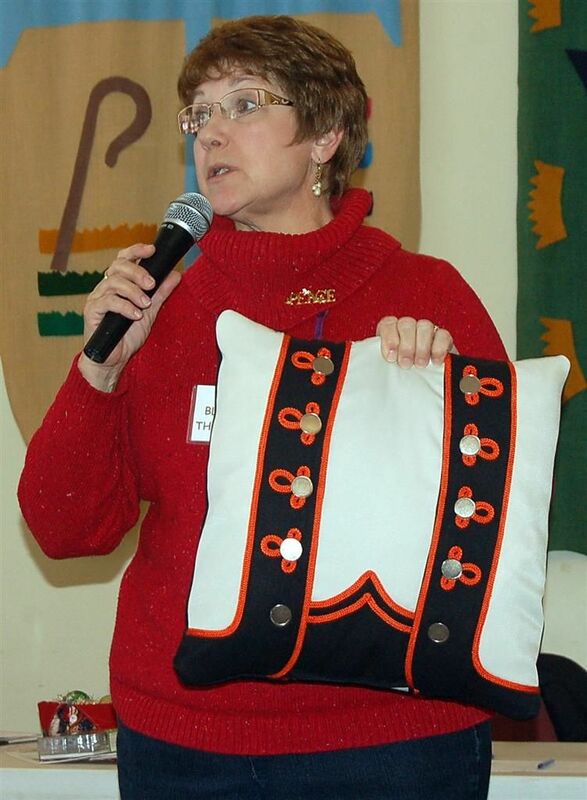 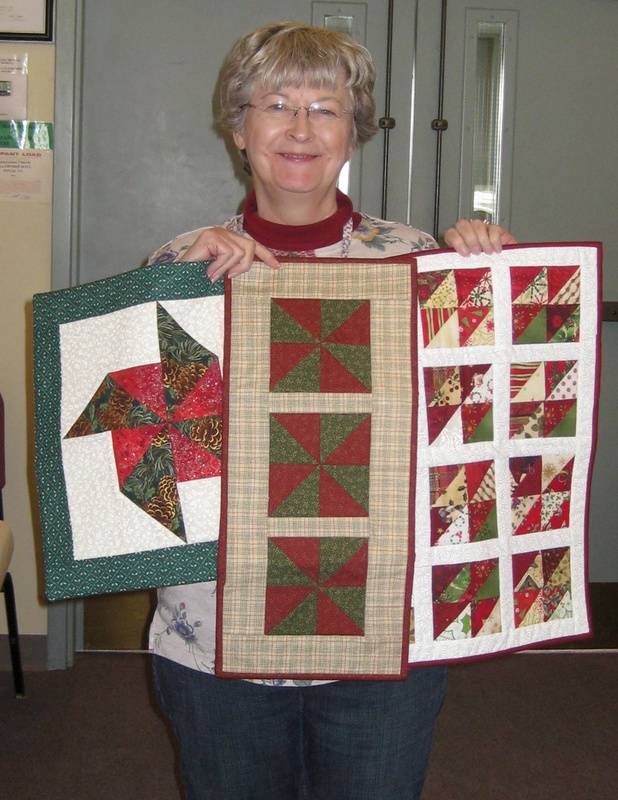 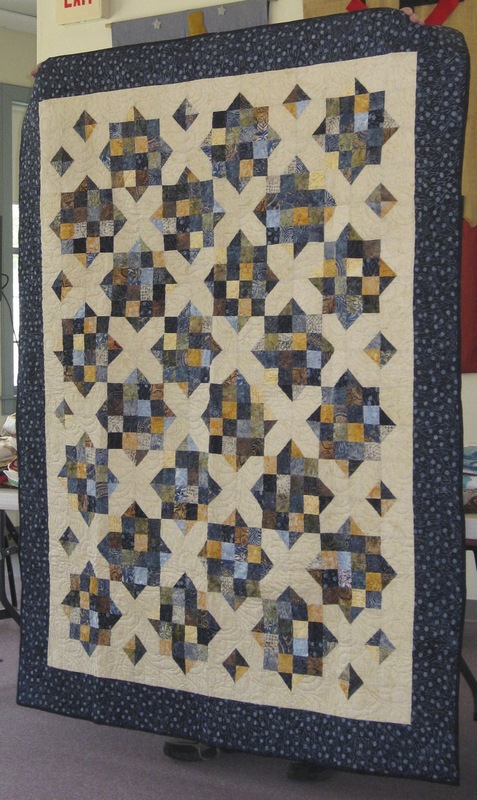 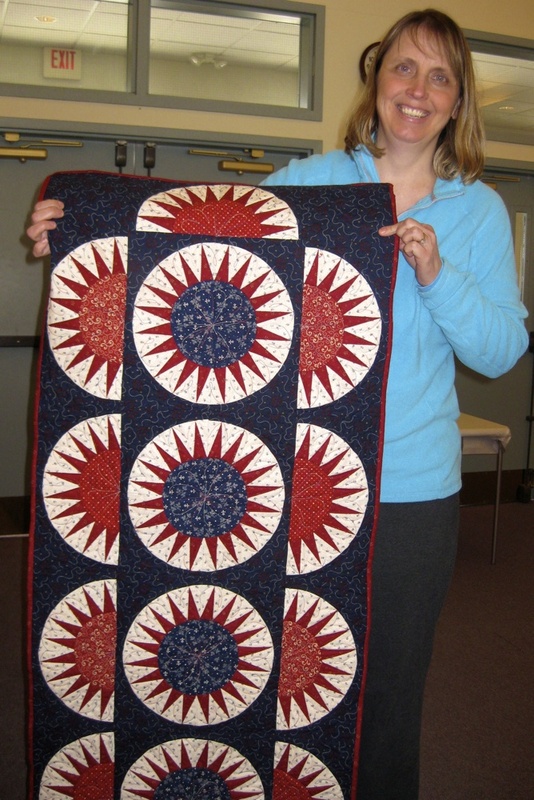 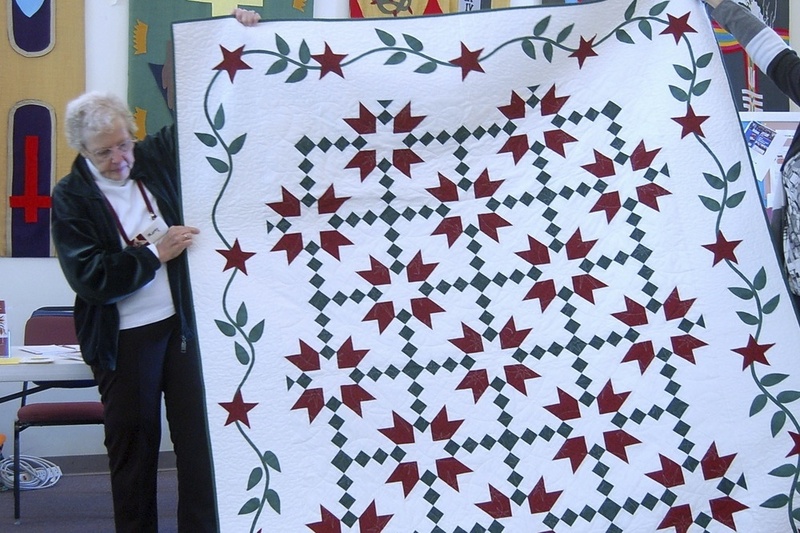 Here is a link to Missouri Star Quilt Co. 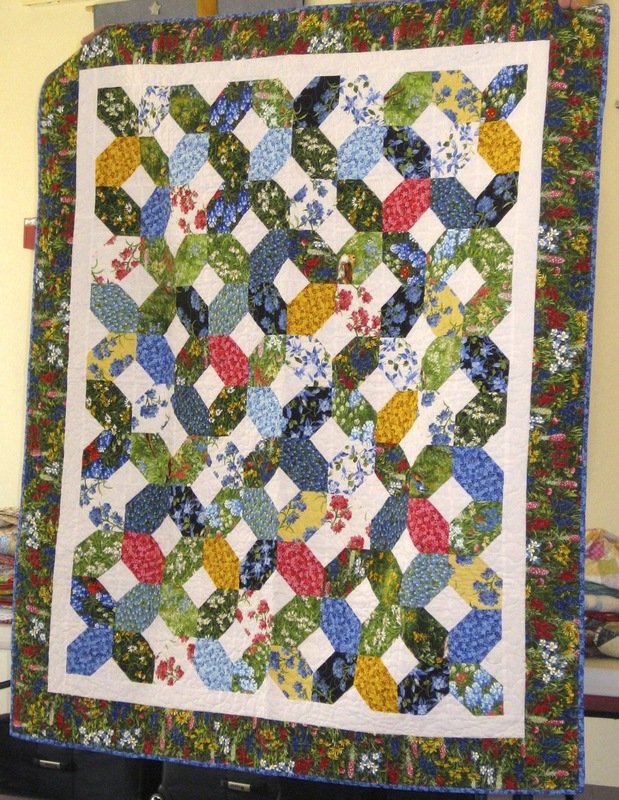 Please note that all shown quilts are not named because the photographer wasn't quick enough to write them down but they can be found on Jenny's tutorials. 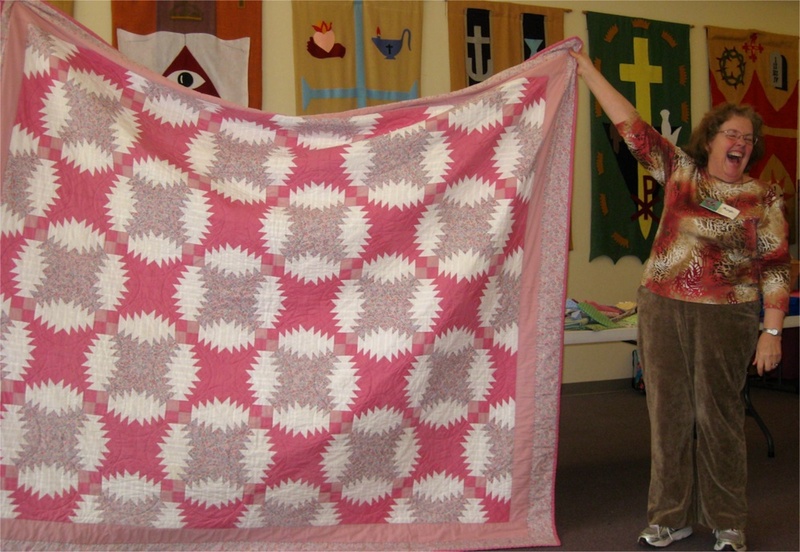 All quilts "hands, feet and head" by Ron, Jenny's husband. 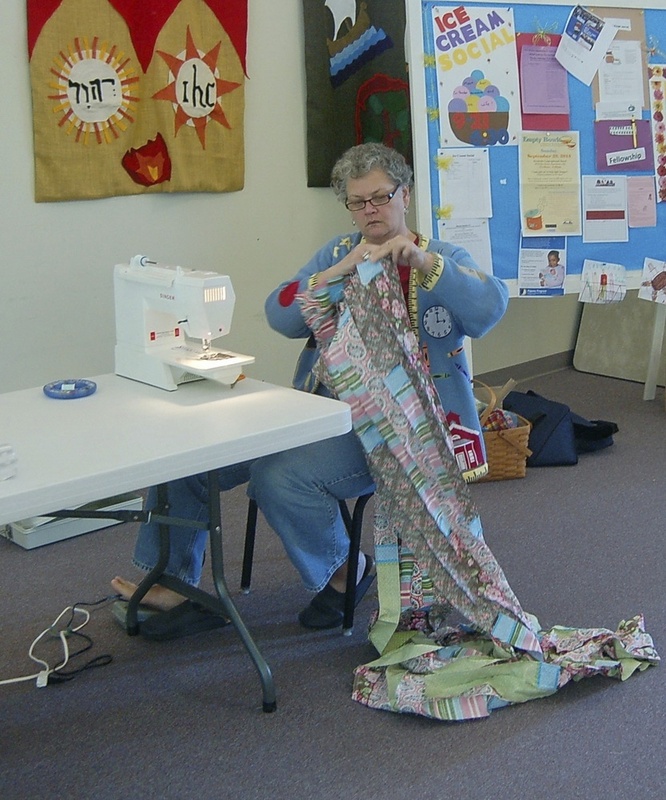 Under the leadership of Tommi, volunteers from our Guild gather in the Bedford Library to sort and cut fabric that are then sewn into quilt tops for FIT, QOV and New Life. 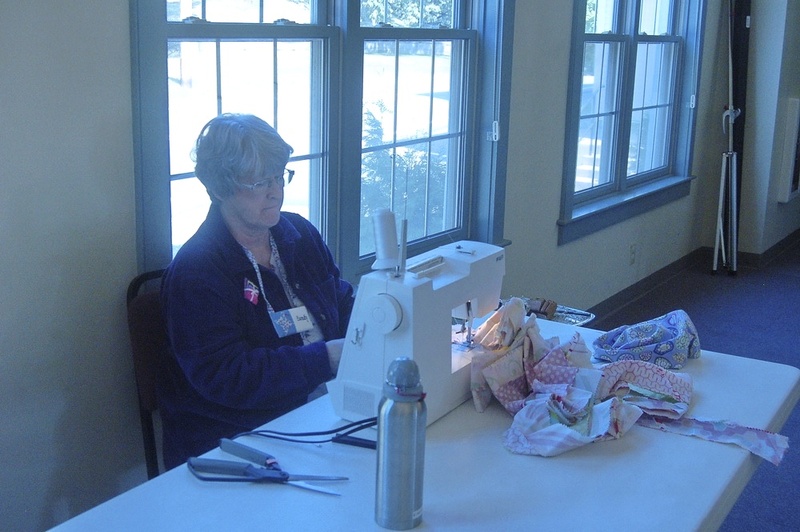 Some volunteers cut and bring in their own fabrics to stitch. 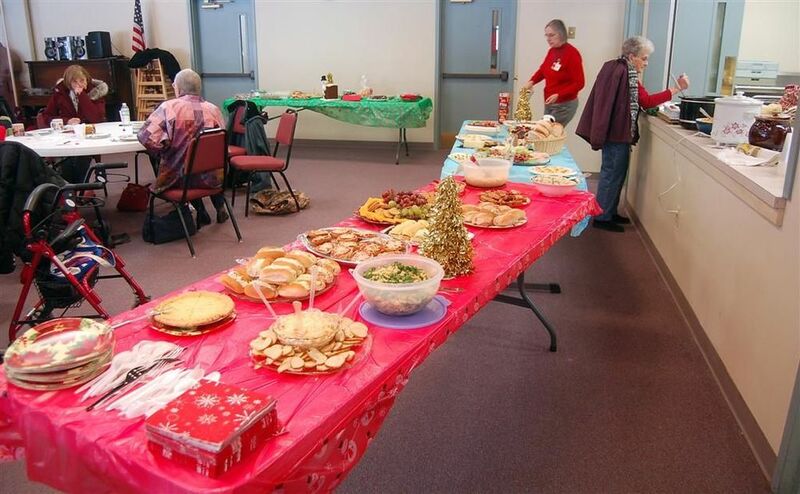 Anyone is more than welcome to join. 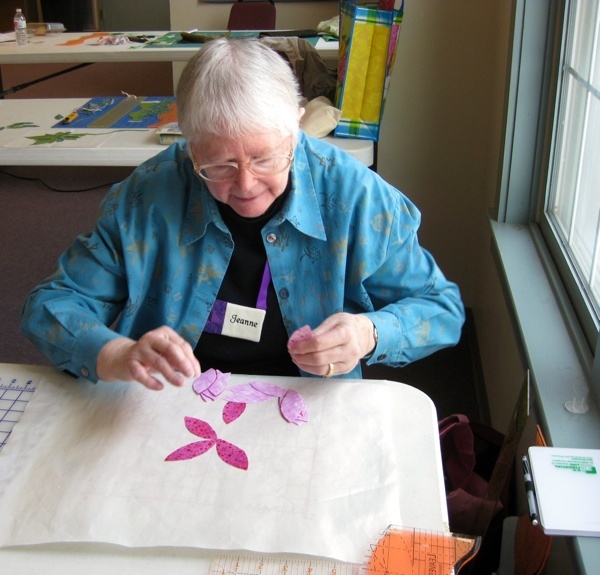 People are needed to stitch, cut, sort out fabrics, prepare backing fabrics, press, etc. 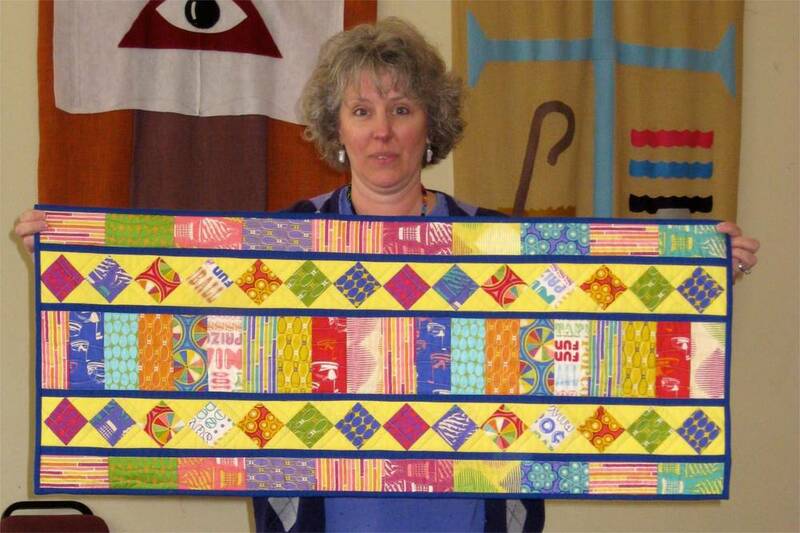 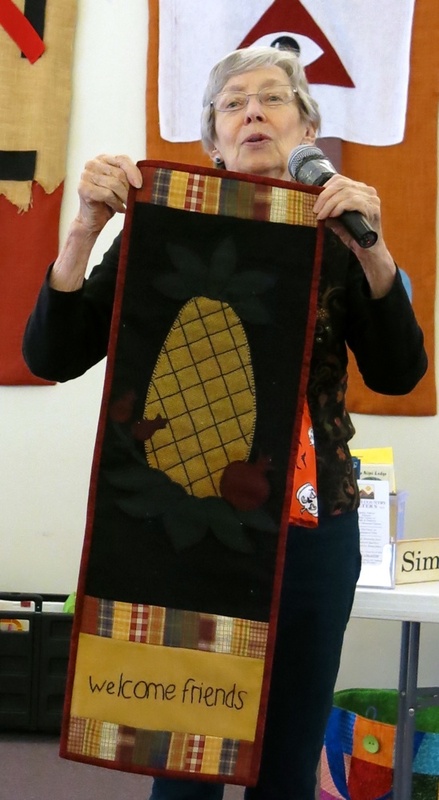 There were so many interesting techniques taught by Sue Pelland in her class on March 11 just by using her amazing plastic templates. 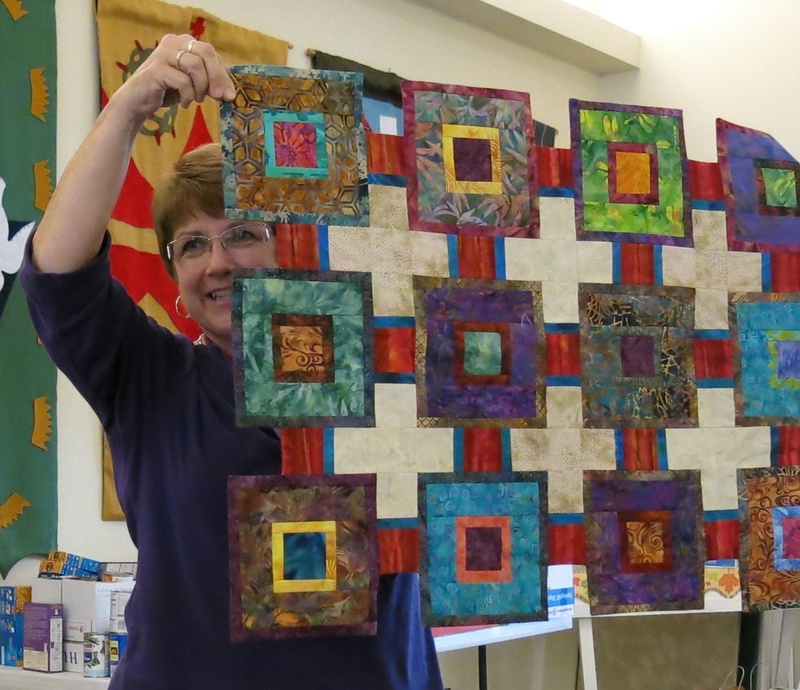 If you missed the class just click on the link. 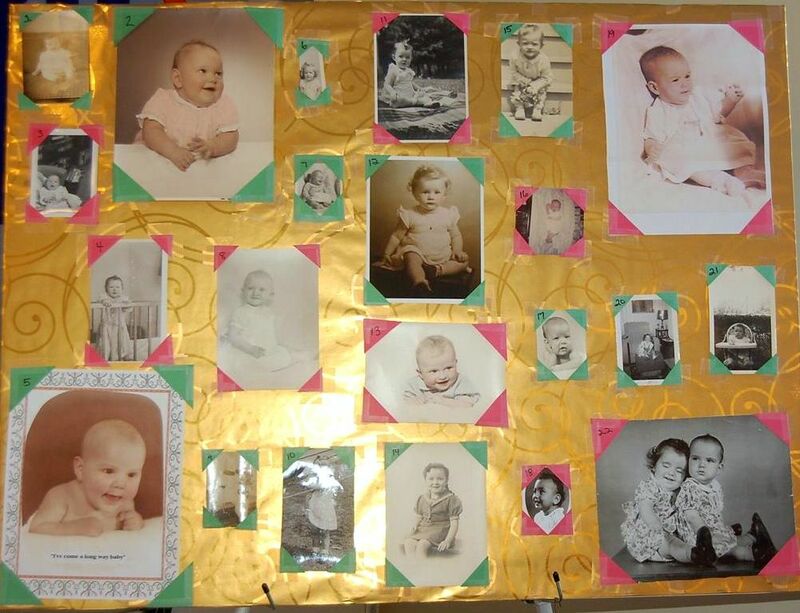 The day truly flew by and the beginning results are amazing. 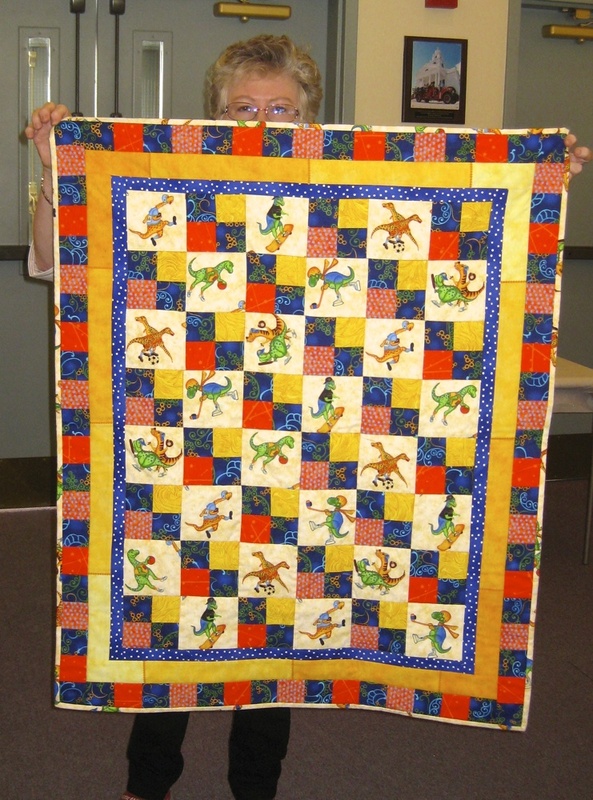 Watch for future show and tells for completed projects. 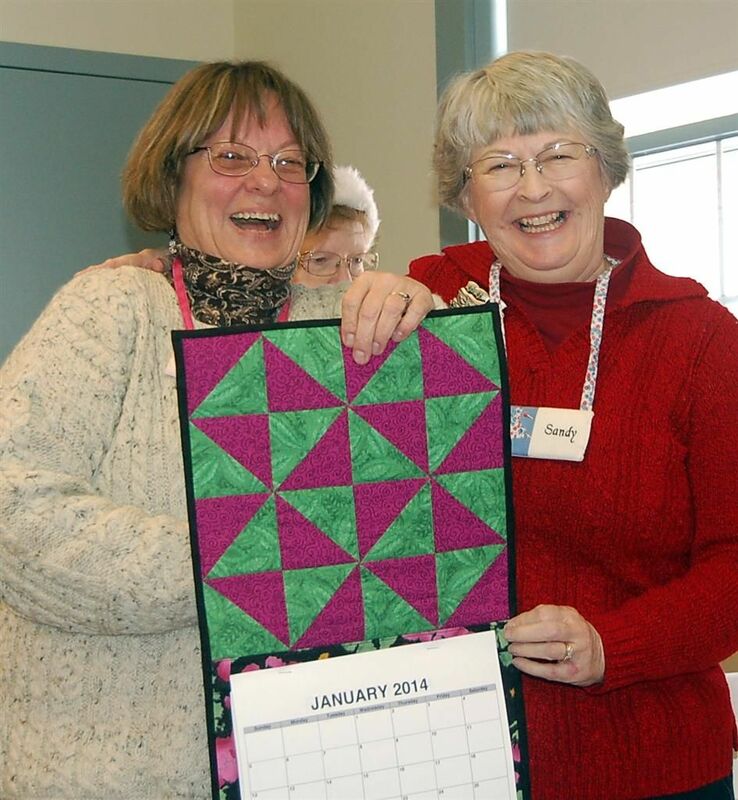 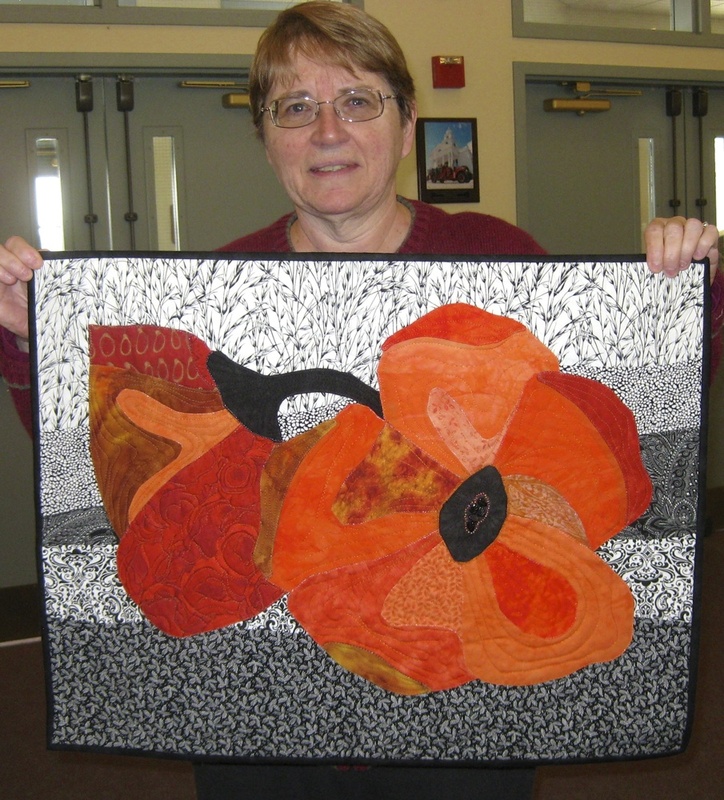 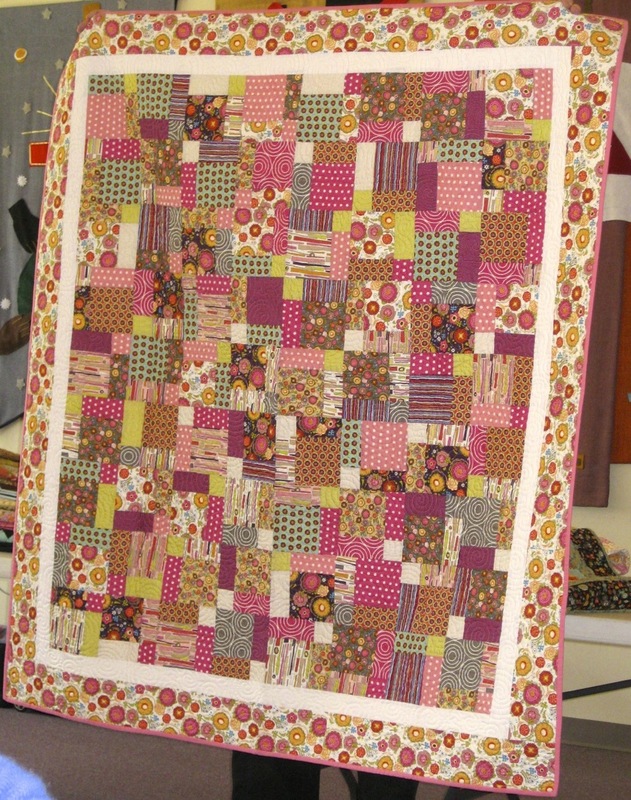 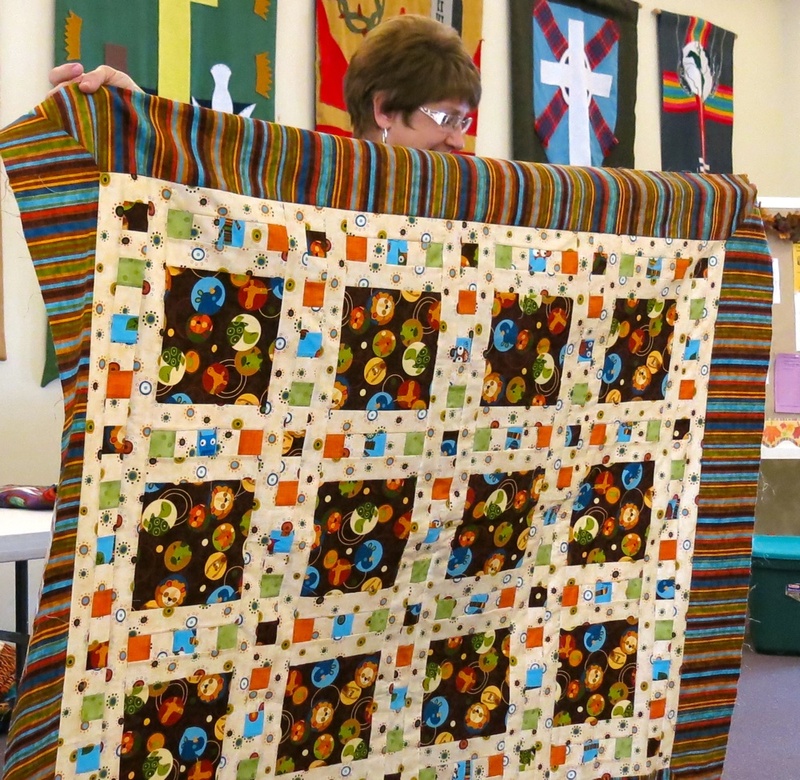 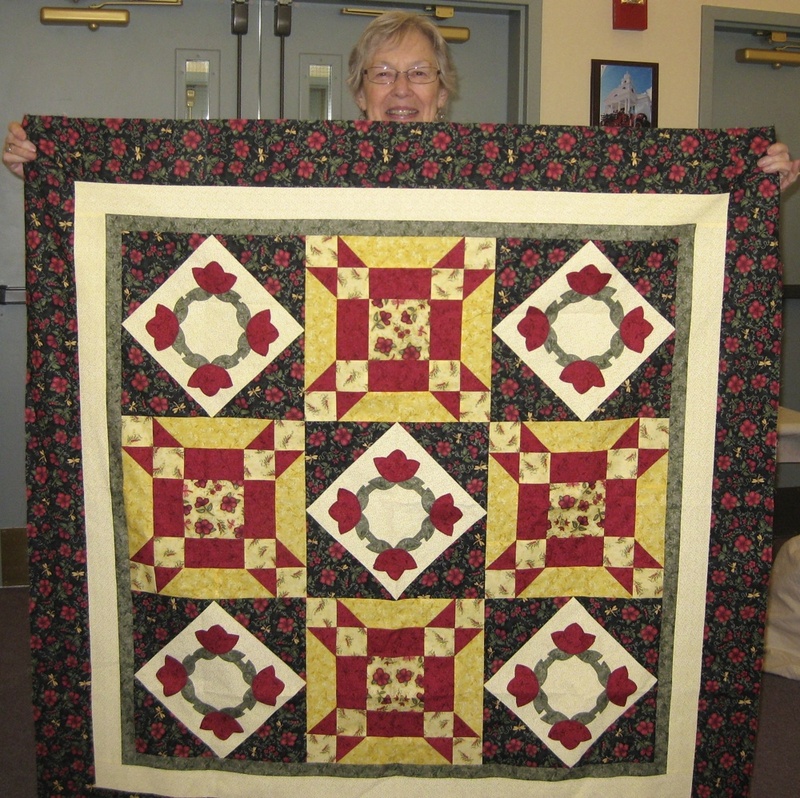 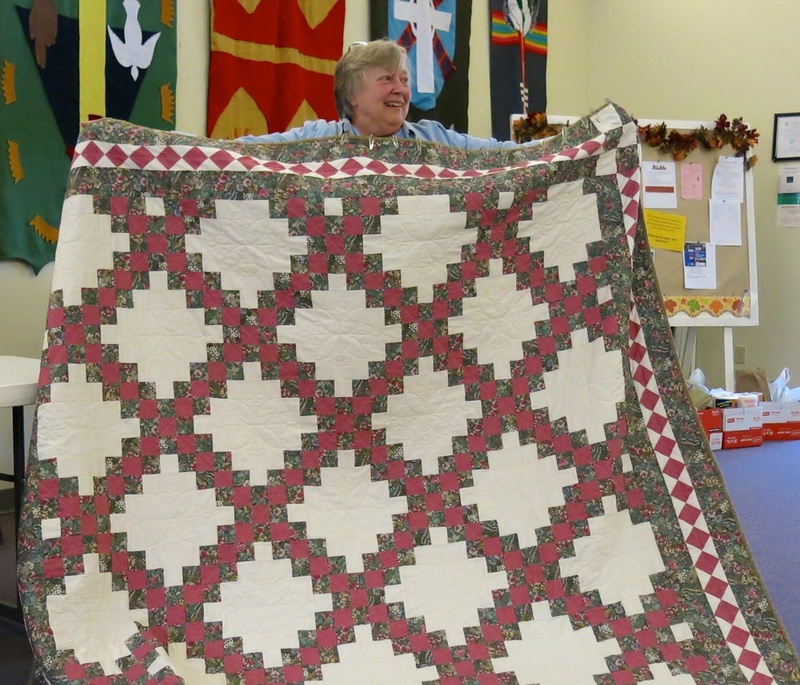 Each month brings more beautiful quilts to appreciate.